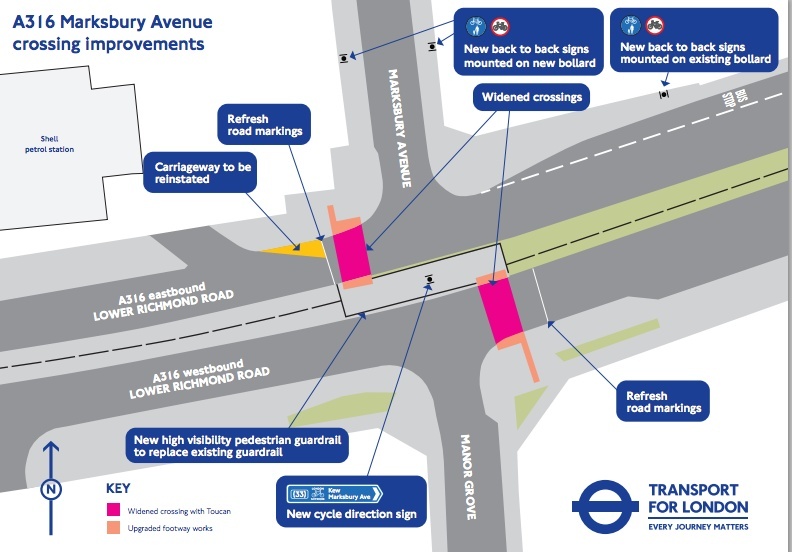 Marksbury Avenue / A316 Consultation. Planned changes at Marksbury Avenue / A316 junction.. The new design improves the crossing, but we think it could be better: why not allow pedestrians to cross the whole road at once, rather than have to wait for up to several minutes to make two separate crossings? Removal of the guardrails could accompany this change: if we are worried about pedestrian safety on this road, the best way to fix it is with much more rigorous enforcement of the speed limits. How does It Join Up? On the south side of this junction is a cycle lane which should be connected to the crossing. Instead of the minor changes in paving, the opportunity should be taken to repeat the design of Elsinore Way. This would mean that the cycle lane would have priority at this minor road, and would become a more attractive, useful place to cycle. Elsinore Way will get priority for cycling. Just south of here is Somerton Road, and a network of quieter residential roads. These could all be part of a wider upgrading of routes to allow cycling both ways on the one way street. 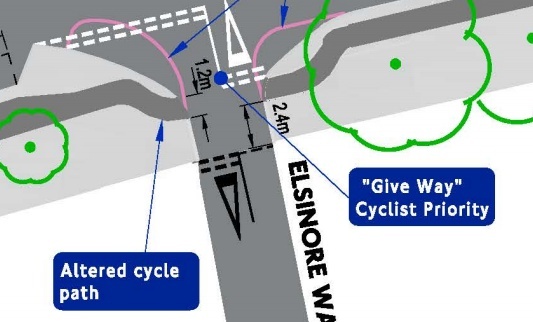 It is Richmond Cycling’s strong proposal that this should be a straight through crossing for pedestrians with a single light phase, and that serious consideration is offered to the improvement of the connected cycling facilities. Please respond to the consultation via their email consultations@tfl.gov.uk or using the form on their consultations page. This entry was posted in Consultation and tagged consultations, Cycle Lane, pedestrians by Campaigns. Bookmark the permalink.